Adding watercolor artwork to your suite is a great way to add texture, color, and personality. But it can come at a few different price points, so here are a few to help guide you on your way. Providing fully custom watercolor pieces on each invitation, save-the-dates, etc is a great way to add personality and a highly custom feel. This means if you need 100 invitations, we would hand watercolor each piece on our letterpress 100% cotton stock, letterpress print over the artwork, and then cut it down to your final card. This works best when painting washes and single color artwork. Each piece will vary in color and be one-of-a-kind. Want a custom watercolor on your wedding suite, but want something more budget-friendly? This is your sweet spot. We will create a one-of-a-kind piece for you. Then flat print the same piece on our letterpress 100% cotton stock for all the invitations, or other pieces. Giving you the custom feel without the cost of painting each one individually. Best for any watercolor artwork! From washes to highly detailed, this is a great way to go. It also works well with other custom artwork pieces. 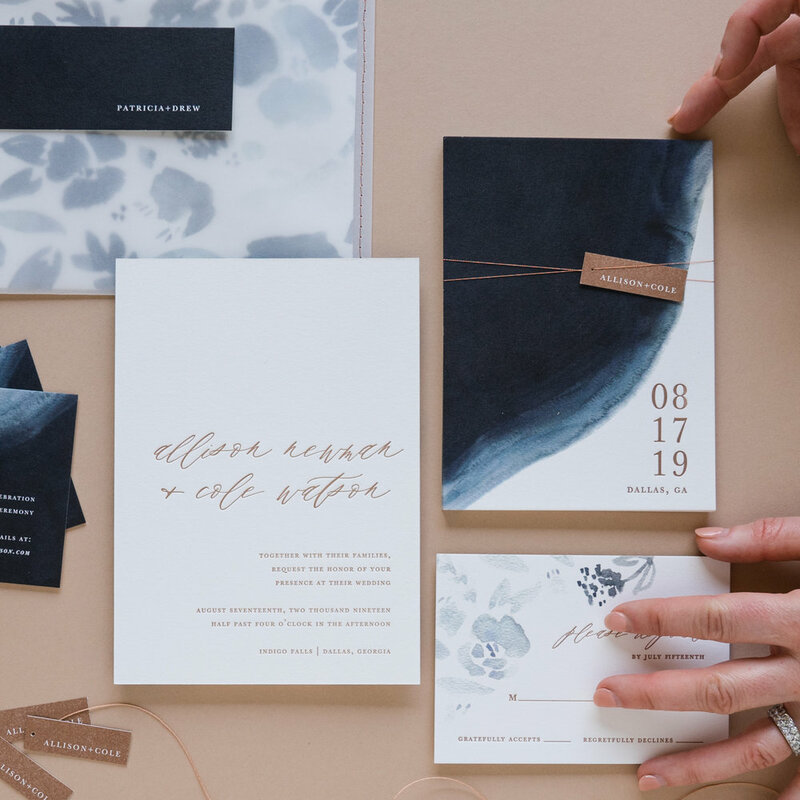 If something custom isn't the most important factor for you, we can help you source stock artwork that we can purchase, and then have printed for use on your wedding paper goods. Great for adding personality without the highly custom look or feel. There are several ways to add watercolor to your custom wedding suite. Schedule an appointment to create an invitation or wedding suite that tells a story to every guest.